Doesn't that just sound great? I've been really excited about this book since I first heard about it a couple of months ago and am looking forward to its release. And isn't the cover just lovely? Or you can click here to watch the trailer at YouTube. 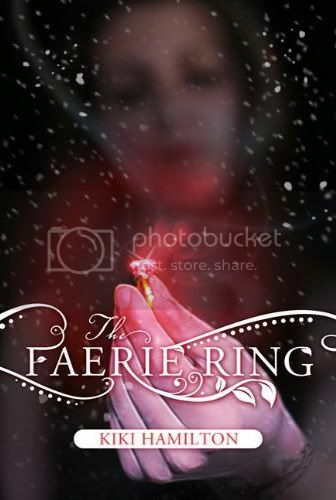 The Faerie Ring will be released on September 27, 2011 from Tor Teen. You can also follow Kiki and Tor Teen on Twitter, or visit Kiki's blog. Kiki has supplied me with five signed bookmarks to giveaway on my blog in anticipation of the release of The Faerie Ring, and all you have to do to enter is to fill out THIS FORM. Contest will be open internationally, so everybody can enter! I'll leave the entry form open until May 21, 2011, and then I'll randomly select five winners and get their bookmarks mailed out to them! A great big thanks to Kiki for sending me the bookmarks to giveaway, and good luck to everybody who enters! Wow the cover looks like it almost glows! This sounds amazing. I love your blog by the way. Here's my WoW, please stop by and check out the blog!